Remove and discard skin from fish. Cut fish into 4 serving pieces. Mix egg white and water with fork. Mix dry potatoes, cornstarch, paprika and lemon-pepper seasoning. Dip just the top sides of fish into egg white mixture, then press into potato mixture. In 12-inch nonstick skillet, heat oil over high heat. Cook fish, potato sides down, in oil 3 minutes. Carefully turn fish, using wide slotted spatula. Reduce heat to medium. Cook about 3 minutes longer or until fish flakes easily with fork. Salmon is familiar to most of us, but artic char may be new to you. Arctic char is related to both trout and salmon and tastes like a combination of the two. Carefully turn over frying fish so that it falls in the pan away from you. This will send any hot oil away from you instead of toward you. Are you an herb lover? 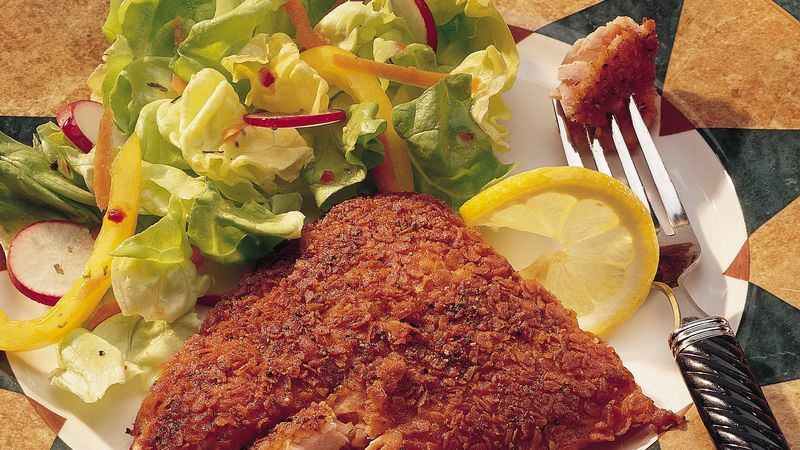 Add 2 teaspoons dried basil leaves to the potato mixture to make Basil Potato-Crusted Salmon.